As South African team entered the ground, few minutes later, it presented itself in the form of Johan Botha, standing at the top of his run up, ready to open the bowling. A pitch that looked relatively flat provided Botha with sharp turn for the third ball he bowled which was quite unique. While Chris Gayle was walking back, Graeme Smith's Zimbabwean strategy of opening the bowling with spin was justified. Smith, who was battling a case of the sniffles, can be forgiven for forgetting the next 20 overs didn't work out for any of the South Africans bowlers. Steyn's first over was worth 11 runs, Jacques Kallis bowled two overs that went for 10 and nine, and Imran Tahir's second over was 11 as well. Darren Bravo threatened to honour the tradition of a West Indian batsman scoring a century against South Africa to cause an upset and they were settling down as comfortably as content cats on a cuddle cushion in the sun. Then came the drinks break. 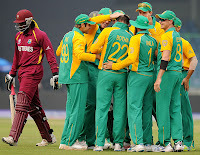 West Indies used it to relax and South Africa to strategise. They came back in a miserly mood. The next six overs had 27 runs scored off them and then Bravo was out lbw to Botha. Smith had been using Robin Peterson from the other end but when one wicket fell, he sensed that it was time to unleash the mystery man. It was a decision laced with risk, a decision that the South Africa of before may not even have considered. This South Africa was willing to chance it. Tahir came back with the confidence of a man who had spent years bowling at this level and took two wickets in two overs, which could have easily been three had he held on to the second return chance that went his way. 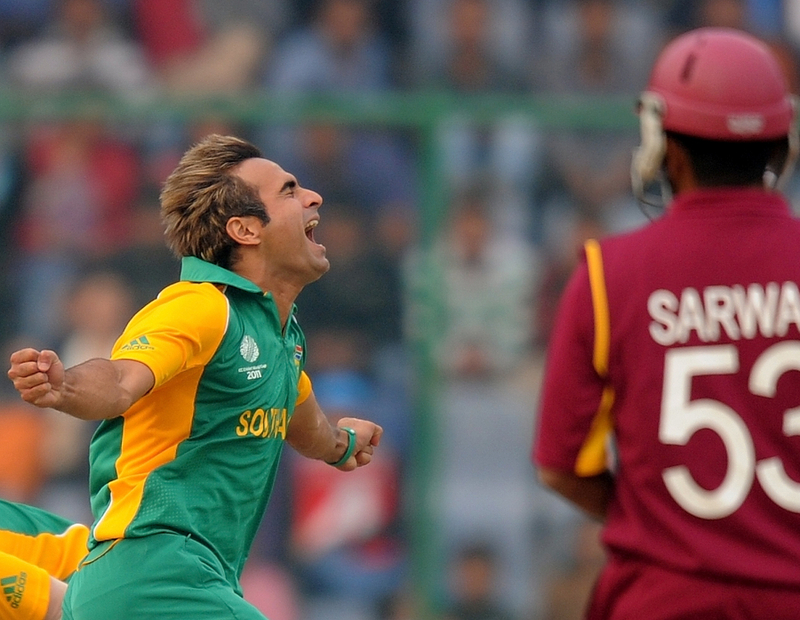 Tahir showed why his debut was more anticipated than start of the tournament itself by most South Africans, disguising the googly craftily and showing no fear in tossing it up, getting hit a bit and then reaping the rewards.Tahir bowled an initial spell of two overs and two more spells of four overs each, the wicket-taking spells. He had Peterson and Botha keeping him company at the other end, with Peterson a silent, yet vital, partner along the way. Peterson had taken the most wickets of any of the South African bowlers in the warm up games and was emerging as an unlikely striker. The presence of three spinners even rubbed off on Steyn, who ran through the West Indies tail with the clinical approach of a surgeon. With the wicket-taking responsibility evenly spread, Steyn could save himself for when he was needed and, as a result, "bowled quicker" at times. He was able to play a slightly different, but equally effective role. Purists would not have recognised this South African attack and, although they may be pleased with its results, they'll be happy to hear that normal service has not disappeared from Smith's mind completely. South Africa have eight days to think about what to do in their next match, against Netherlands in Mohali. Until then, they can bask in the knowledge that their captain is living up to his promise of being dynamic and affording them the luxury of variation, and that he is enjoying the unpredictability. 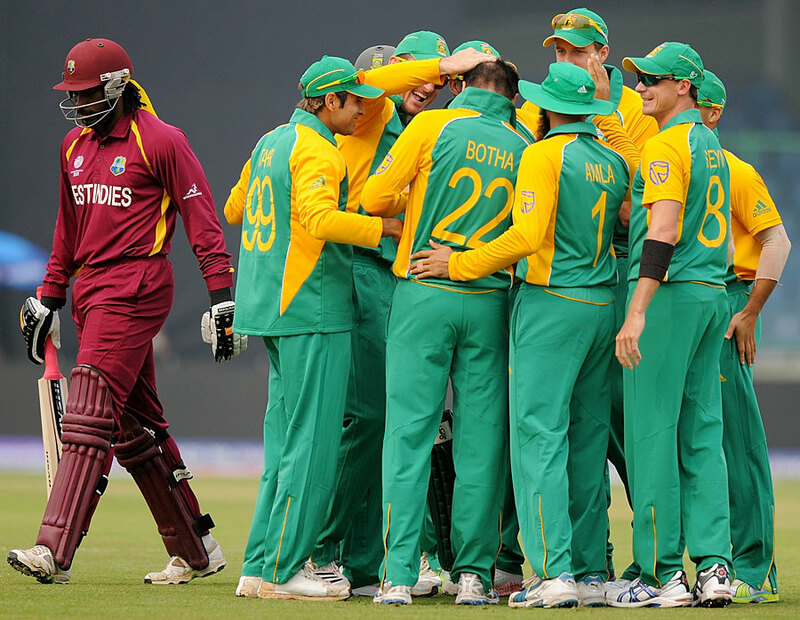 Indeed, a great victory for Proteas and West Indies have to pull-up their socks immediately. Windies also got handicapped because of the injury to Bravo. Ι lοved aѕ much as you'll receive carried out right here. The sketch is attractive, your authored subject matter stylish. nonetheless, you command get got an impatience over that you wish be delivering the following. unwell unquestionably come further formerly again as exactly the same nearly very often inside case you shield this hike.